Abbi here from Abbi Kirsten Collections. 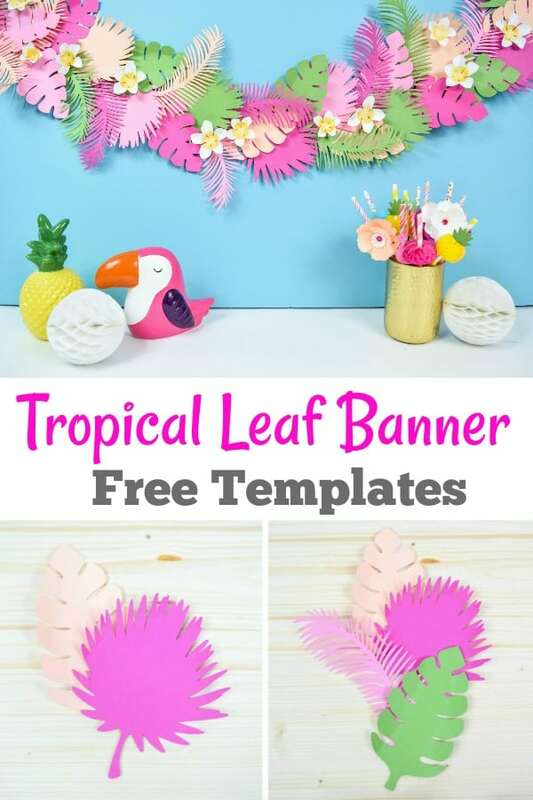 I’m excited to be guest posting and sharing this fun tropical leaf paper banner project on Color Made Happy. I’ve been feeling a bit tropical in the studio since the heat of summer has official arrived! 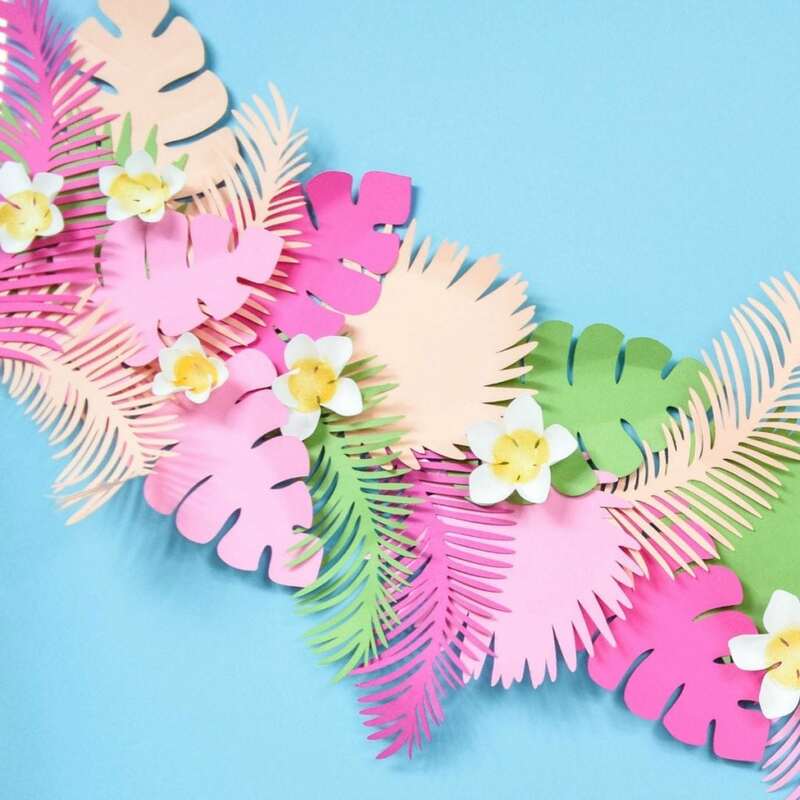 If you are planning a summer barbecue or maybe a festive luau party, this tropical leaf paper banner is the colorful addition you need for your next get together. When preparing to make your banner start by choosing your favorite colors. You could opt for a bright traditional color scheme of greens or go for a more fun vibe like our pinks, peaches and green mix in this project example. In addition to the tropical leaves I chose to use, I also wanted to add a bit of floral flare by adding in some white flowers with yellow centers created using my favorite ink. Start with downloading the set of 3 leaf and flower templates below. You can use the SVG with your favorite cutting machine or the PDF for cutting by hand. If you decide to hand cut, you can print the templates directly onto the paper for easy cutting! Step 1: Begin by cutting out all your leaves. The number of leaves you cut will depend on how long you want the banner to be. I made my banner about 3 1/2 feet long. I used 21 leaves in my banner and a dozen white flowers. 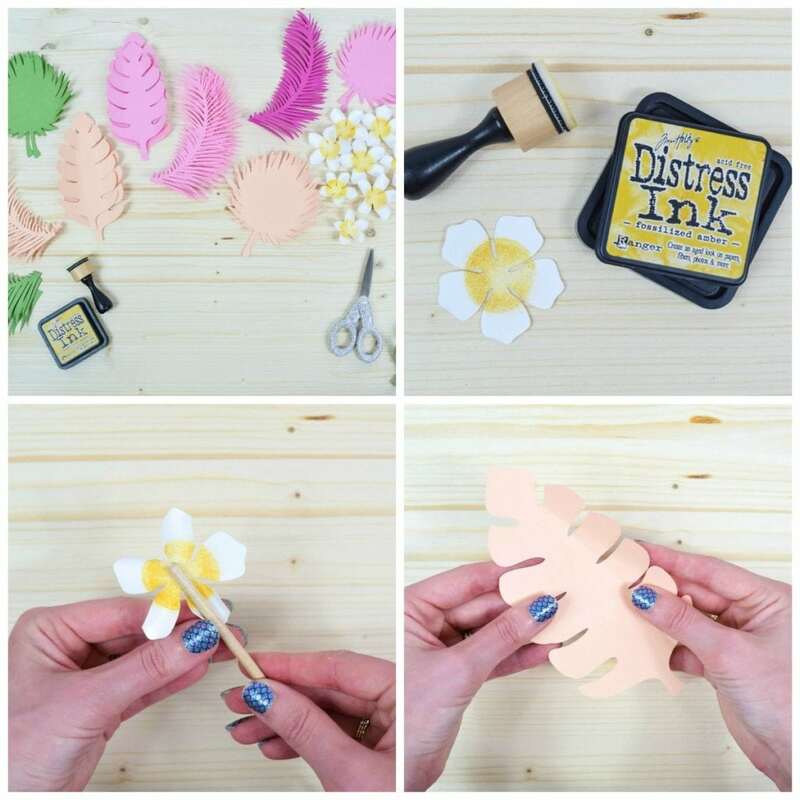 Step 2: Use the ink to stamp the center of the flower if you wish. Then curl the petals by wrapping them around a thin wood dowel. 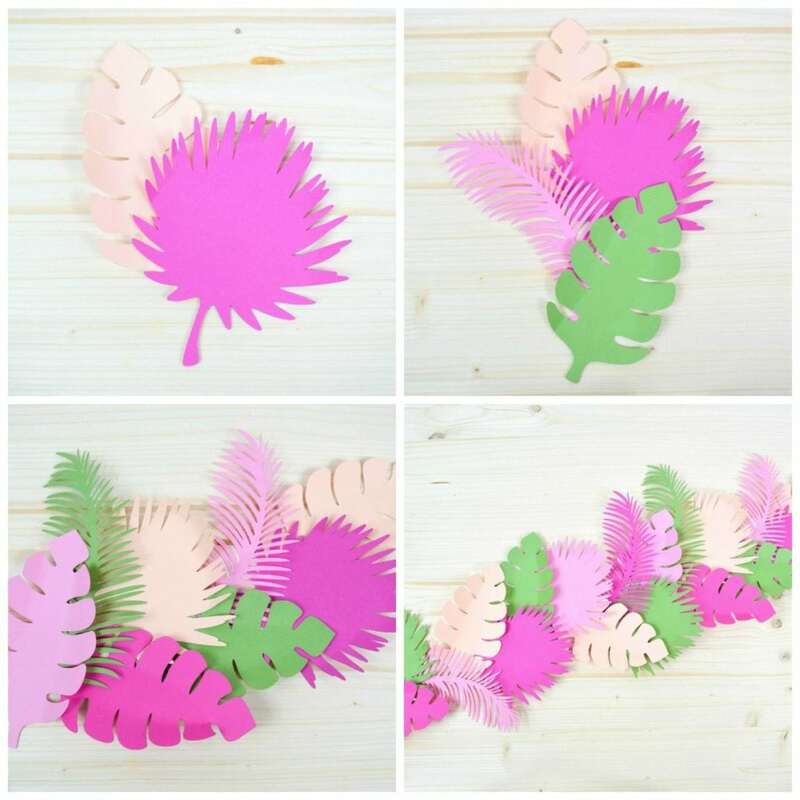 Step 3: For your leaves, you can either use your fingers to gently fold the edges up to give them some dimension or use my Paper Blooms shaping mat and tool to curl the leaves. Step 4: To build the banner you will be overlapping each leaf with another as you go. If you prefer the banner to be curved, be sure to glue the leaves together in a slight curve as you go. Step 5: Once you are happy with the shape and length of the banner flip it over. Cut a piece of ribbon to size as needed, making sure to leave extra on each end for creating a loop or tie so it can hang. Glue the ribbon all along the back. Step 6: To finish, decide where you want to place your flowers and secure them with glue. 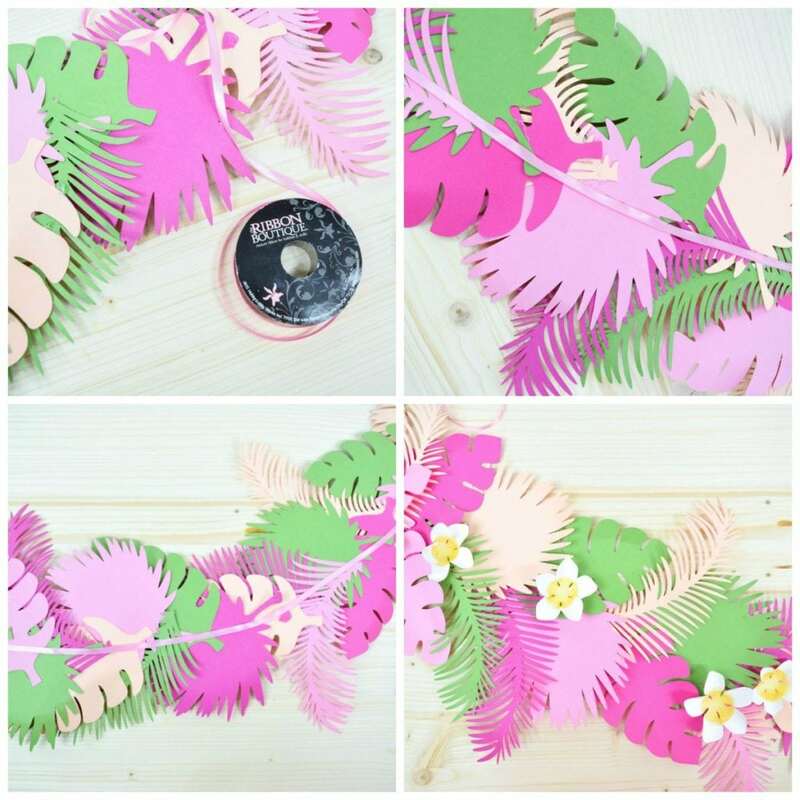 This tropical paper floral banner will be the perfect pizazz for a summer gathering or luau. 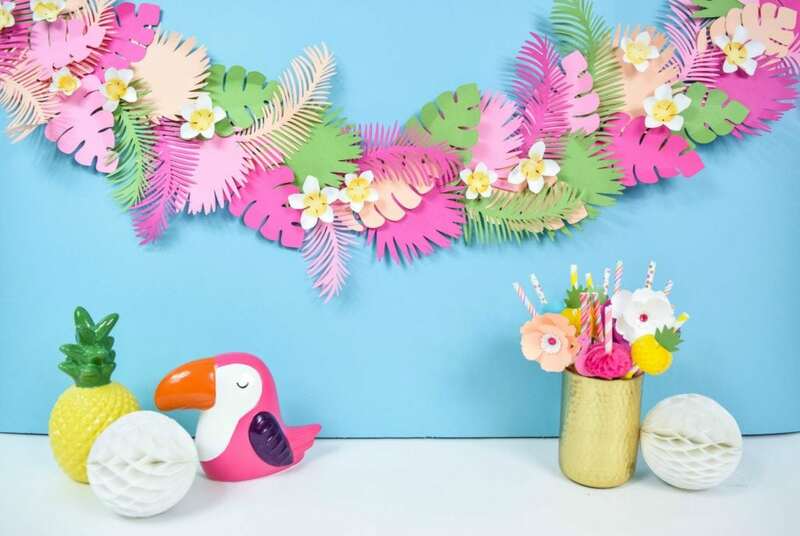 To go with your snazzy banner, be sure to check out our other summer party décor tutorials including how to make, Hawaiian paper flowers, Hibiscus paper flowers and our newest paper pineapple party decorations! How would you use this cheery banner at your party or home? Tell me below in the comments! Share what you’ve been up to by using #DIYwithAbbi. I would love to see your creativity in the works, so flaunt your flower power magic! You are a huge source of my inspiration! 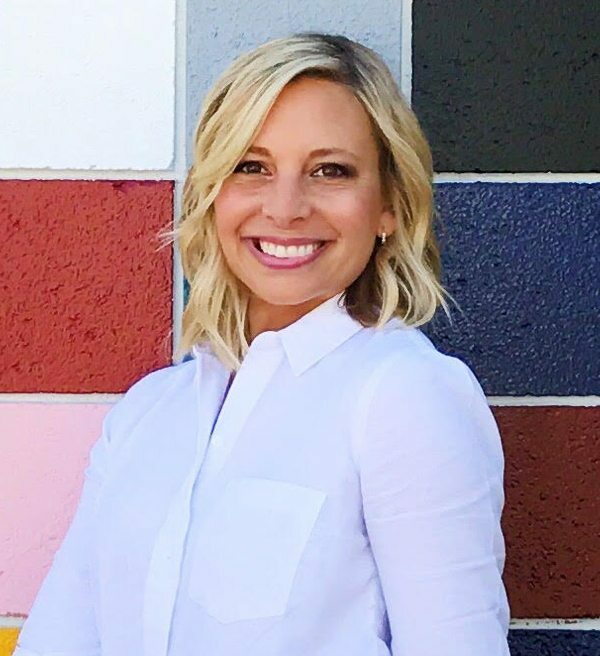 My mission at Abbi Kirsten Collections is to inspire you to nurture the creative magic inside your soul – bringing you fun, easy to learn DIY projects, and quality template designs. I share a variety of projects, but specifically love paper crafting and paper flowers. Interested in more flower tutorials?! I’ve created dozens of signature designs for you to enjoy – starting with my best seller, The Art of Giant Paper Flowers, the Giant Flower Library and my shop of endless paper designs and flower templates. Feeling overwhelmed? Start here with my tried and true Resource List! Thanks for letting me pop into your day! Follow Abbi and all her creative paper crafts on Facebook, Instagram, YouTube and her Blog!